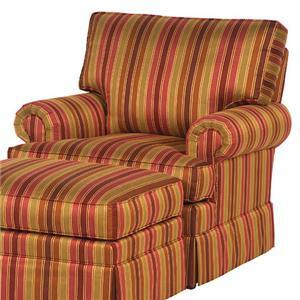 This example of an Upholstered Arm Chair (38) from this customizable collection includes a loose box border back (1), rolled panel arms (4), and a 7 inch skirt base (7), and is finished with a deep, bright striped upholstery. With two different back options, seventeen separate seating arrangement pieces, four arm style options, four base style options, and over 1,200 different fabric options to choose from, this collection features furniture tailored to match your specific and direct design needs. 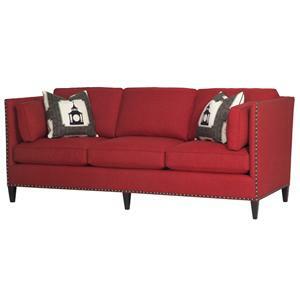 This example of a Customizable Upholstered Sleeper Sofa (05Qs) from this customizable collection includes shaped English arms, knife edge semi-attached back cushions, and a 9 inch kick pleat skirt (K42), and is finished in a burnt crimson upholstery. This collection gives you the ability to tailor your upholstered furniture and meet every style and design desire you might have. 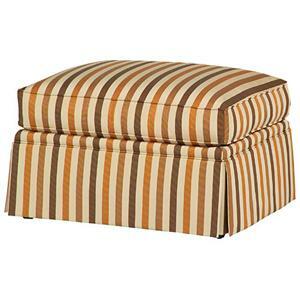 This example of an Upholstered Ottoman (KM) from this customizable collection includes an Ultra Aire cushion and a 10 inch skirt base (0). With two different back options, seventeen separate seating arrangement pieces, four arm style options, four base style options, and over 1,200 different fabric options to choose from, this collection features furniture tailored to match your specific and direct design needs. Clean, chic and contemporary, the geometrical shape of the Beekman sofa will enhance your living room with modern style. Nail head trim line the frame, highlighting the sleek, boxy frame. 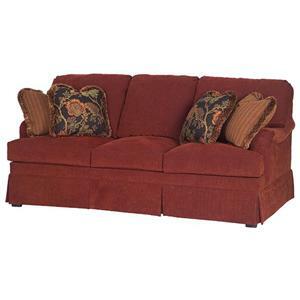 Featuring plump Ultra Aire seat cushions, this stationary sofa provides additional comfort with two 19 inch pillows and two arm bolsters with posh down filling. Shown with optional 1/2 inch gimp on base. Enjoy a wide range of special order fabrics for a unique look that suits your style. 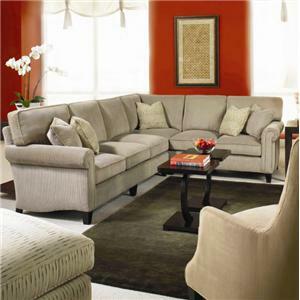 This example of a Sectional Sofa combination (31+15+22) from this customizable collection includes a loose box border back (1), rolled panel arms (6), and 5 inch tapered wood legs (8) , and is finished in a ridged corduroy type of fabric. With two different back options, seventeen separate seating arrangement pieces, four arm style options, four base style options, and over 1,200 different fabric options to choose from, this collection features furniture tailored to match your specific and direct design needs. 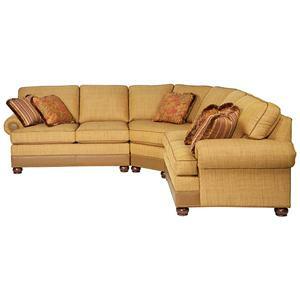 This example of a Sectional Sofa combination (21+25+22) from this customizable collection includes panel rolled arms, a box border semi-attached back, and Montana bun feet (K55), and is finished in hatched light tan upholstery with nailhead trim. This collection gives you the ability to tailor your upholstered furniture and meet every style and design desire you might have. 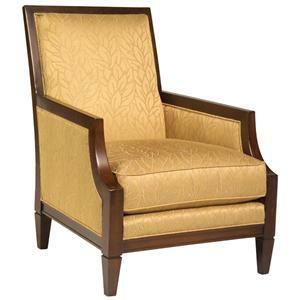 The Wiseley chair makes a wonderful accent piece for any room in your home. This chair features exposed wood arms, tapered legs and an exposed wood frame with an "X" crossed seat back. With a tight back and Ultra Aire seat cushion, this chair offers comfortable seating for your living room, three season porch, family room or home office. Enjoy a wide range of special order fabrics for a unique look that suits your style. 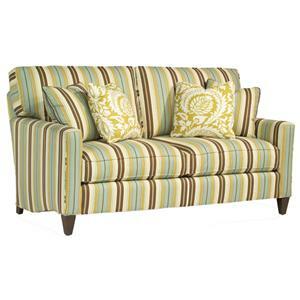 This example of an Upholstered Mini-Sofa (72) from this customizable collection includes a loose box border back (1), track arms (3), and 5 inch wood tapered legs (8), and finished with a wide bright striped upholstery. With two different back options, seventeen separate seating arrangement pieces, four arm style options, four base style options, and over 1,200 different fabric options to choose from, this collection features furniture tailored to match your specific and direct design needs. 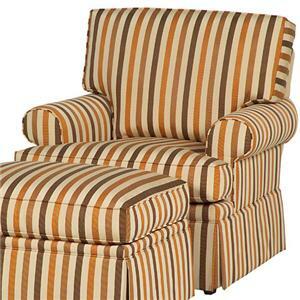 This example of an Upholstered Arm Chair (38) from this customizable collection includes a loose box border back (1), rolled sock arms (6), and a 10 inch skirt base (0), and is finished in an earthy striped upholstery. With two different back options, seventeen separate seating arrangement pieces, four arm style options, four base style options, and over 1,200 different fabric options to choose from, this collection features furniture tailored to match your specific and direct design needs. 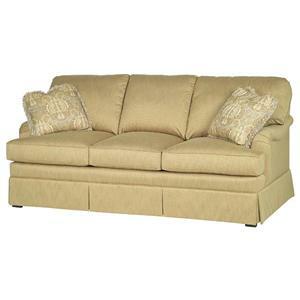 This example of a Customizable Upholstered Sofa (03) from this customizable collection includes shaped English arms, knife edge semi-attached back cushions, and a 9 inch kick pleat skirt (K42), and is finished in a light golden upholstery. This collection gives you the ability to tailor your upholstered furniture and meet every style and design desire you might have. Taylor King, a locally owned upholstered furniture designer and maker located in Taylorsville, North Carolina, continues to introduce new designs influenced by current, contemplative lifestyle trends. Taylor King combines new furniture designs, and especially new fabrics, with three decades of quality manufacturing traditions. The Taylor King brand of bench-made upholstered seating helps set important tones in the industry and step forward comfortably to capture a new, cozy lifestyle. Taylor King is a major employer in Alexander County, North Carolina, and prides itself in the fact that many of its employees have been with the company since its initial founding in 1973.